After 30 years and with more than 1 million examples sold, Mazda feels that the MX-5 is no longer its own creation. It belongs to the fans around the world who have supported the development of the model. 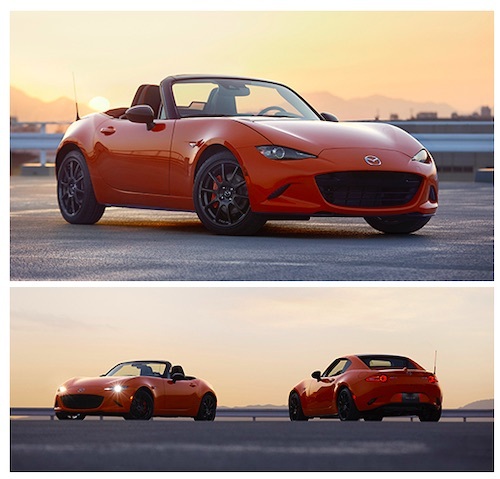 To express its gratitude, and its high hopes for the future of the MX-5, the company developed Racing Orange, an exclusive body color that evokes the breaking dawn of an exciting new day. In addition to the new color, the MX-5 Miata 30th Anniversary Edition features forged aluminum wheels (Rays ZE40 RS30) developed exclusively for the MX-5 in cooperation with Rays Co., Ltd. and a 30th Anniversary badge that displays the model's serial number. Sales will be limited to 3,000 units worldwide, including both soft-top and retractable hardtop models. Mazda will continue to make cars that exceed expectations and provide driving pleasure in everyday driving situations. The company aims to build a strong bond with customers and become an indispensable presence in their lives. (1) Press days are February 7-8. Mazda's press conference is scheduled for 11:30 a.m. (local time) on Tuesday, February 7.